According to Ukrainian legislation o each foreigner is obliged to be insured during his stay on the territory of Ukraine. This requirement applies to all types of visas. On the basis of Art. 16 of the Law of Ukraine "On Tourism" travel insurance is obligatory and is realized on the basis of contracts with insurance companies. At the poles it is must be provided for the provision of medical care when the insured event in the country (place) of their temporary residence, insurance shall be effected only once during the entire trip. Also, Art. 11 of the Law of Ukraine "On Legal Status of Foreigners and Stateless Persons" provides that an alien may be denied a visa in the absence of a real pole of health insurance. That`s why, we strongly recommend to issue the insurance to all the period of your trip. 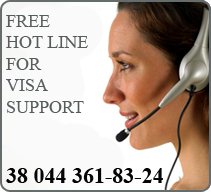 Our company provides a complete package of services for the visa to enter Ukraine including insurance.